Indian Power Industry's - Major Challenges & Future Scope | Business Article | MBA Skool-Study.Learn.Share. The exemplary economic growth exhibited by India in the past decade at a constant rate of about 7.5% CAGR has truly been phenomenal. One of the major forces enabling India to achieve this impressive feat has been the advancements made by the Power sector in terms of capacity and availability. It has been facilitating an efficient transition from labor to machine intensive production and constantly fuelling the energy requirements of various other industries. It remains one of the most critical components of infrastructure that affects economic growth. With the ambitious “Power for All” by 2012, a target formally announced by the Indian Power ministry in 2003, the Indian power sector seemed set for a massive boost backed by incremental investments both by the Government and private players. Although there was much hoopla in the beginning, it all faded out slowly. Currently, India ranks 5th in the world in electricity generation and is placed at 6th when it comes to net electricity consumption. An interesting fact is that the per capita annual consumption of electricity in India is one of the lowest in the world at approximately 818.9 KWh when compared to the world average of 2600 KWh and 6200 KWh in European Union, which can majorly be attributed to the population growth and the inability of the sector to achieve its target capacity addition. For a country considered to be a rising economic power, more than 300 million people still have no access to electricity. There is a worrying demand supply mismatch with a peak hour deficit reaching about 10.5%. In the past year alone the gap between demand and supply has grown to 10.2 % up from 7.7% the year before. The crippling hindrances for this are delays in target capacity addition, distribution losses, raw material shortages, excessive dependence on domestic equipment manufacturers and non conducive Government policies. The stakes involved and the severity of these issues may be disastrous for the industry at large and all other stakeholders if ignored for long and may affect India’s economic growth prospects adversely. 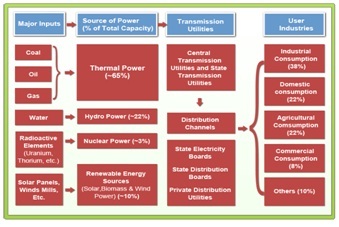 The entire value chain of the power sector in India is dominated by the Central and State sector utilities. In the Power generation space the percentage share of State and central utilities stands at 50.4% and 32.6% respectively. The story remains pretty much the same in Power transmission and distribution space. The central and the State utilities own nearly 87% of the total distribution network. India currently has an installed capacity of 205 GW. This falls short by a long way when we consider the present energy requirements let alone the ever growing demand for electricity due to mass urbanization and increasing population. The Centre had targeted capacity addition of 100,000 MW each in the 12th Plan (2012-17) and 13th Plan (2017-22), although the 12th 5 year plan’s target has now been reduced to 75000 MW owing to shortage of fuel supply. Rapid buildup of generation capacity is aided by the setting up of Ultra Mega Power Projects (UMPP) each of which offers 4000 MW capacity. Some of the major issues in realizing the proposed capacity additions and performance inefficiencies are discussed in the next section. Thermal power generation is majorly based on inputs like coal, oil or gas where one of the three may be used as a primary source. Coal contributes to about 84% of the total thermal production with oil and gas contributing 15% and 1% respectively. The overall performance efficiency of thermal plants was about 56% in 2011. Thermal Power production in India is heavily reliant on coal as a primary source. India has about 10% of the world’s coal reserves but the coal production to reserve ratio is just 0.94 which is significantly lower when compared to China’s ratio of 2.83. Domestic production of coal hasn’t grown significantly in the past few years and the domestic market for coal is monopolized by the State owned enterprise, Coal India Ltd owning 80% of the production. Coal India Ltd is required to sell coal at a heavily discounted price, so it too has very little liquidity to invest in new capacity or technology. Supply constraints for domestic coal remain are expected to continue going forward. Public and private sector companies are forced to import large quantities of coal. The change in international market environment like the introduction of new regulatory frameworks in Indonesia and Australia is resulting in rise in prices of imported coal, giving rise to financial instability. Oil and Gas based plants were operating at 57% efficiency in 2011.The rising prices of oil globally, fall in currency value of rupee and reduction in the domestic gas production has impacted severely causing a high financial instability for operating these plants. India’s reduction of imports of oil from Iran and unsuccessful attempt of establishing gas pipeline has also severely dampened the future raw material sourcing prospects for these plants. India is currently in talks with Iran for import of electricity rather than fuel, as importing electricity is much cheaper option than importing fuel for producing Power. India ranks 5th in the exploitation of Hydro power in the world. India is endowed with economically exploitable hydro-power potential to the tune of 148,700 MW. But the current Installed Capacity is mere 38,600 MW which shows a major gap between the potential and its exploitation. Major barrier for the growth of Hydro Power is the land acquisition for building dam, reason being the threat of flood which may alter the landscape and affect the local community. A large number of hydropower projects having common river systems between adjoining States are held up on account of inter-state aspects The existing tariff formulation norms for hydro projects with no premium for peaking services and the provision for 12% free power to distressed states from the initial years are also proving to be deterrents to this segment. Wind turbine generator capacity addition in India has grown at a CAGR of 24.6% from 41.3 MW in 1992 to 13065 MW in 2010. India has a huge potential for wind energy generation owing to its 4000 Km long coastline which is currently unexplored due to high investments required for offshore wind energy. Current low utilization is attributable to several factors like inadequate grid connectivity, high cost of wind turbines and time consuming land clearance issues. Lack of grid connectivity has caused a loss of almost 30% of wind power produced. The implementation cost of a solar power station is relatively high owing to the expensive equipments and large scale land requirement for its setup. Domestic equipment suppliers are heavily dependent on import of wafers used in solar cells. Frequent delays of domestic suppliers in delivering the orders on time have forced many players to import equipments, which are subject to heavy taxes. Power transmission and distribution is perhaps as important as Power generation. T&D in India is the 3rd largest in the world. Current installed transmission and distribution capacity is about 110 GW which is considerably low compared to generation capacity of 182 GW. Globally, investment in generation to T&D is in the ratio of 1:1; however in India this ratio is 2:1. India’s distribution losses in 2011 was about 21.5% of the total power production, which is significantly higher when compared to the other top ten power producing nations. Although distribution loss percentages are decreasing year-on-year, the absolute loss value has not been improving much. Distribution losses are due to lack of a comprehensive information system, which hinders especially in arresting theft. Lack of efficient equipments used for stepping up/stepping down power at the electricity stations and substations is also a major contributor. Lack of stringent regulatory laws leading to delay in credit payment causing financial instability to the already debt ridden companies which is dampening the mood in the distribution sector. In spite of the hurdles plaguing the Power sector several recent developments have been inspiring confidence in the sector. In one such move Coal India Ltd has recently agreed on ensuring a minimum supply of 80% of contracted quantity of the coal to thermal power plants. The company has lined up an investment plan of Rs 7500 Cr to develop the railway track and related infrastructure which will help to evacuate around 300 Mt of additional coal annually. Government has also proposed a basic duty exemption on import of equipment used for coal mining which will enhance the productivity of coal extraction. Proposals to allow the involvement of private sector in further exploration and evacuation of coal are also under consideration. The recent shale gas exploration in the Gangetic plain has also been encouraging. This will enhance the prospects of domestic sourcing for gas based plants. Government has proposed duty exemption on the import of gas for production of power. Proposal to import gas from neighboring gas rich countries like Bangladesh are also under evaluation. .
Government is also aiming at enlarging public sectors involvement in mega hydro projects and multipurpose projects involving inter-state issues and those with rehabilitation and resettlement issues. Ministry of renewable energy is providing financial incentives to private players for setting up of small hydro projects. International civil nuclear co-operation agreement with major developed countries on supply of nuclear fuel can make significant contribution to capacity addition. The 12th five year plan proposals are being finalized which envisages start of work on eight indigenous 700 MW pressurized heavy water reactors, two 500 MW fast breeder reactors, one 300 MW advanced heavy water reactor and eight light water reactors of 1000 MW or higher capacity with foreign technical cooperation. A central committee has been formed to study the feasibility of nuclear power with emphasis on disaster management and safety up-gradation of the plants so as to allay the fears of local communities. Government has proposed a tax holiday of 10 years for renewable and mega power projects to encourage private player participation. It has also increased the spending on R&D activities related to the growth of renewable energy segment. In 12th five year plan it is proposed to increase the spending on grid capacity addition providing connectivity to the offshore wind turbine generators. to improve its efficiency. Power Grid Corporation is on the threshold of taking a giant stride forward in its quest to set up a 1,200 kV transmission test station through collaborative efforts with 35 leading Indian manufacturers under the public-private partnership model. Additional transmission capacity is also required to evacuate power from surplus region to deficit region and to enable electricity trading. With proactive Government involvement in undertaking favorable policy amendments and increasing participation of private players the future of the Indian power sector looks slightly more assured. These developments though are not enough but can definitely help bridge the demand-supply gap, which is a daunting task going forward. This article has been authored by Praveen Rathod & Prashanth Ramesh from NITIE.